In his 1976 book “The Imjin Roll”, Colonel E.D. Harding computed the Gloucestershire Regiment’s losses in prisoners after the battle of the Imjin to have been 522. Fewer than fifty men from the forward Companies had broken through the Chinese forces which had encircled the battalion. When Major Grist reported the state of the battalion on 27th April, only 217 men were present, the majority of whom had been with the rear echelons during the battle. With replacements from the U.K. the Glosters were slowly brought up to strength and by July 1951 were fully operational again. 29th Brigade Group had found itself back on the Imjin by 23rd May. In July, 29th Independent Brigade Group became 29th Brigade, Commonwealth Division, but the Glosters’ time with the new Division was to be short as the Battalion returned home in November. After the Battle of the Imjin, the forces of the United Nations had been able to stabilise the front north of Seoul on the “No-Name Line”, before taking up some of their former positions on the Imjin later in the year. As a result of the battle, Chinese 63rd Army, which had started out with three divisions totalling approximately 27,000 men between them, had lost over a third of its strength and was pulled out of the front line. British 29th Brigade Group (including the attached Belgian Battalion) had borne the brunt of 63rd Army’s attacks, and had gone into battle about 4-5,000 men strong. The Brigade Group lost 1,091 in killed, wounded and missing, of whom 620 were from the Glosters. The battle had been a Pyrrhic victory for the Chinese, and a short-lived one at that. 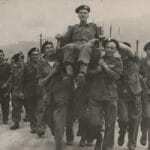 The British prisoners of war, however, were still in Korea. “. . . I dropped down into the stream and, as the clear, running water rippled past, I lay face down in its shallow depths. I could hear sporadic shooting and mused, ‘Maybe I’ll lie here and pretend I’m dead.’ Then the thought of a bayonet in my back passed through my mind. Revived by that life-saving drink, I was seized by a wave of anger and, grabbing a rock in one hand, I determined that I would not die like a coward. I stood up and an amazing sight met my eyes. A horde of armed, lightly leather-belted men in sand-coloured uniforms were hugging and shaking hands with our blokes, who, like me, were in a state of shock. Who the hell were these men? South Korean or North Korean guerillas? On their feet were tattered gym shoes. The Chinese we had seen to this date had all been wearing padded uniforms. The burst of hope that had sprung up in my mind changed to resignation when I realized that they were Chinese soldiers in their summer uniform. Most of the Glosters were captured on the morning of 25th April 1951, exhausted and with little or no ammunition. Some managed to evade capture for a little longer and, during the march into captivity, some attempted to escape but were recaptured. The prisoners were marched north towards camps along the Yalu River, where they arrived in June. Most of the prisoners ended up at Camp Number One at Chiang-song or Chongsong, and officers and senior NCOs were separated from the rest. The unluckier ones came under the guard of the North Koreans, who tended to be much more brutal than the Chinese, but in December 1951, all prisoners came under Chinese control. Lieutenant Terry Waters of the West Yorkshire Regiment was attached to the Glosters during the Imjin battle and found himself in North Korean custody near Camp Number Twelve at Pyongyang. Conditions were terrible with men dying daily in the filthy tunnel in which they were caged. A visit from a North Korean Political Officer promised the prisoners a transfer and far better treatment if they would volunteer as “Peace Fighters”, i.e., become part of the Communist propaganda machine. In order to save the lives of the men under his command Waters ordered them to pretend to co-operate, even though he refused to do so himself. His action saved many lives, though he himself was to die in captivity, and he was posthumously awarded the George Cross. “Study periods were grossly misnamed. They consisted of sitting on a hard floor from four to five hours listening to tirades against one’s country from a silly Chinaman. Certainly a trifle boring so one can hardly blame the listeners for finding other ways of passing the time. Some lucky ones slept (to be woken by Chinese guards – a full time job on their part), some played “battleships”, others cultivated a blank expression whilst lost in other thoughts, and one even deloused himself! – to the Chinese disgust and our amusement. “. . . Inside the door through which you are looking is a small smoke and steam filled room, a few feet below ground level. Along the end wall of this room is a mud and stone constructed platform containing two large identical iron pots some 3 to 4ft. in diameter, approximately 18in. deep and with their curved under-bellies exposed to two wood fires. This was the prisoners’ “kitchen”. Other items adorn the walls – a home-made fly swatter, two tin drinking mugs, a gourd for ladling water, two paddle-type wooden spoons to stir the contents of the iron pots. In one pot a mass of purple-tinted Golian is bubbling and forming a thick starch-like scum on the surface. In the other a brown and brackish liquid conceals Dikon Chunks. “To the uninitiated, Golian resembles a poor-quality millet not unlike pearl barley. Dikon is a type of pale yellow fibrous turnip, slightly bitter to the taste and equally unappetizing. The latter is cooked by cutting the Dikons into small cubes and boiling them furiously in water. “Standing in front of these iron cauldrons are two sweating figures, one American, one English. These are the “cooks” clad in the familiar Chinese style blue uniforms worn throughout the length and breadth of communist China. “The Church of the Captivity was the worshipping community and fellowship of the baptized within the prison camp. It was my privilege to be their priest: chaplain to the Church of Captivity. Our corporate worship was offered to God in the camp lecture-room. Mostly this room echoed with the discordant sound of political indoctrination or “people’s trials”, but from time to time voices of prayer and praise rose within it. “It was a drab cold room, about 60 by 20 feet. On one side it was flanked by a corridor, along the stretch of which you looked in through glass panes, on the camp parade ground. Portraits of the world’s Communist leaders hung there until secretly torn down by desperado prisoners in March, 1952. A big “trial” developed out of this. Later that year, the walls were covered by lurid “Germ Warfare” posters, and Chinese guards were placed in the lecture-room day and night. At our times of worship we placed Colonel Carne’s little stone cross on a rough wooden table, draped with a length of blue curtain, and flanked it with rice bowls full of wild-flowers in season, and with candles when we had them. Everyone gathered around, either standing or squatting on the floor-boards, or sitting on blocks of wood. “Our services were simple, consisting of three well-known hymns, corporate confession, absolution, two scripture readings, a psalm recited by me, prayers and sermon. We had one Book of Common Prayer (with English Hymnal), and several New Testaments. Every month the Chinese issued us with quite big sheets of cigarette paper. Men donated this precious paper for religious use and gradually we made over forty little hymn books, using cigarette paper and odd squares of cardboard, held together at the spine by pieces of cast-off material sewn with infinite patience. People would volunteer for copying the words. For a few of the Glosters, the experience of being a prisoner of war was not a new one. Some had been taken prisoner at Cassel with 2nd Battalion in 1940, and had remained prisoners until 1945. A handful of the British soldiers had previously been the prisoners of the Japanese. But of all the Glosters who survived the ordeal of captivity in Korea, it was probably Lieutenant-Colonel James Power Carne who had the most difficult time. As the senior British officer in Communist hands, he was selected for special treatment, involving long periods of solitary confinement and isolation. In an early period of isolation Colonel Carne had carved a small Celtic Cross in stone, which was used by Padre Sam Davies in his church services. Later, his knife was taken away, and no more carving was allowed. Picture: Lt.Col. J.P. Carne being chaired by his men after his release from captivity.